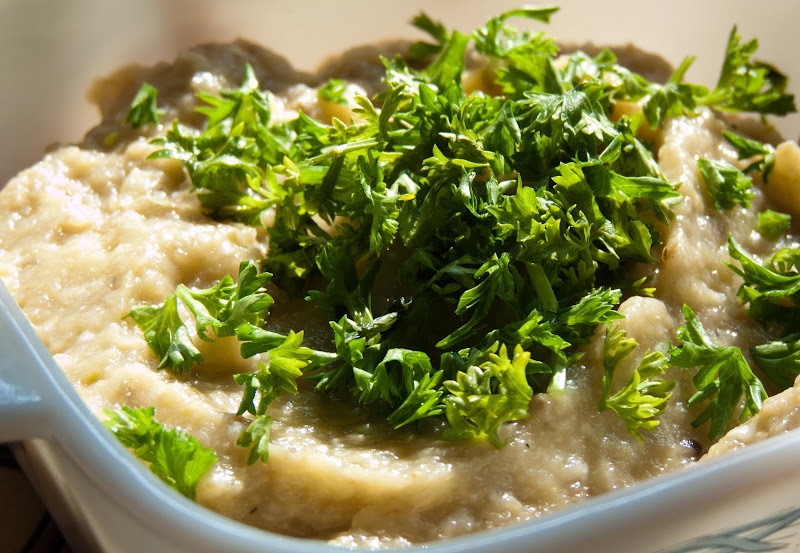 Before I moved to Mumbai, guacamole used to be the #1 dip for me, but I haven't been able to find a tasty avocado here so far... Baba ghanoush might just win me over now. I love eggplant and I love smokey eggplant even more. It's light and flavourful and it takes so little time and effort to prepare. Be warned though, it will get wiped out during your party in no time, so you might want to make more of it, if you'd like the compliments to keep coming that is ;o) This amount will be enough 4, maybe 6 people if you are serving it along with plenty of other starters. 1. First you need to smoke/roast the eggplants, which you can do either on a grill or, as I do it, over a gas stove. Wash and prick them with a fork, smear with some olive oil and put it straight on a medium flame of your gas stove. Keep turning it frequently until it becomes soft inside, it takes me around 10 minutes. Let it cool down until you can touch it. 2. Peel the smoked eggplants and remove the stalks. 3. You will get the best texture if you mash the eggplant flesh with a plain fork till it's creamy, but still slightly chunky. Alternatively, you can put it into a blender/food processor for literally one moment. If any liquid separates while mashing, drain it. 4. Mix in the minced garlic, tahini paste, lemon juice and sprinkle salt to taste. 5. Just before serving, top with fresh parsley/corriander and drizzle with olive oil. It's perfect with pita bread! If grill or gas stove are not available, you can roast the eggplants in an oven for 15-30 minutes depending on the size. For a different and more intense flavour, instead of using fresh garlic, you can also roast a whole garlic head in an oven and then just squeeze roasted garlic paste out of the cloves. You can garnish the dip with ground cummin or paprika powder, but I like it just like that!